Red Box & Green Box Karaoke: Sing Karaoke for FREE! Print & Redeem this voucher that entitled for FREE one (1) Head Charge! Print and present this voucher upon check-in at the reception counter to entitle for a FREE one (1) head charge, valid with minimum of 2 paying normal head charges (person) or above. You are allowed to print multiple vouchers but limited to use one voucher per room per visit. This voucher is only valid from Lunch Hour onwards. Not valid with other promotions discounts and vouchers. Hurry up!! Grab your FREE karaoke experience now! 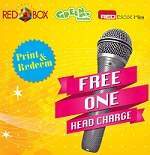 Like, Print and Redeem Red Box Karaoke Voucher!